This tasty Easter Macaroons recipe is sure to be a crowd-pleaser at your next family get-together! These adorable macaroon nests filled with colorful candy eggs taste just as remarkable as they look! I love a good macaroon recipe, don’t you? There’s something so crumbly and delicious about the baked coconut all flaky and light yet crisp and delicious. This Easter Macaroons recipe is a fairly easy and straight-forward recipe to make, too! A great one to get the kids involved with, especially with the “smooshing” part with spoons to make the well for the “nests” part! So much fun and delicious, this is a huge kid favorite for sure! Using and melting candy melts make this recipe pretty simple when adding the candy eggs or jordan almonds. The candy melts harden and set, holding the candy melts or jordan almonds in place far better than say a frosting would. Plus, candy melts are pretty tasty and add that sweetness to the macaroon, you know? Just enough on top there, but not too much. We used yellow candy melts but you could easily choose another color if you wanted! We used a normal sized muffin pan with twelve wells, which makes a fairly good sized macaroon, but you could easily use mini muffin pans instead. Using mini muffin pans would yield more cookies, too! Which is something to consider if you’re making these Easter Macaroons for a lot of people, say for a large family get together or party, you know? Should you opt for the mini muffin pan, you’ll have to make your parchment paper squares smaller. I’d make them about 1.5 by 1.5 inches or so. A typical coconut macaroon such as this recipe is generally made in a round shape by spooning the macaroon mixture onto a lined baking sheet with a cookie scoop. Here, in this recipe, the macaroon is inverted and pressed to make the well for the melted candy melts and candy eggs (or jordan almonds). They’re so perfect, don’t you think? My favorite way to make coconut macaroons usually is to use a mini-muffin pan and melting CHOCOLATE in the middle of the well! It tastes like a girl scout cookie! So yum! Let’s get started! 🙂 Preheat your oven to 350 degrees F.
Cut your parchment paper to twelve squares measuring about 3×3 inches in size. Line your each cavity of muffin pan with your square parchment pieces and set aside. In a large bowl, mix together the shredded coconut and condensed milk until the ingredients are well combined. Using two spoons (size tablespoon or larger), scoop your coconut mixture into each lined muffin section, filling it up about 2/3 of the way. Use the back of one of your spoons to create an indent in the center of each unbaked macaroon. Creating this well before baking will help make the “nest” shape to fill later. Bake in your preheated oven for approximately 10 to 12 minutes, keeping an eye on it. Ideally, you’ll want the edges to be browned. Remove the macaroons from the oven and allow to cool on a cutting board or cooling rack. In the meantime, place yellow candy melts and coconut oil in a microwave-safe bowl and microwave in 20-second intervals until completely melted. Stir in between microwave sessions until smooth. Using another spoon, add a dollop of the melted yellow candy into the center of each macaroon. Immediately top the melted yellow candy with three candy eggs (or jordan almonds) while it’s still warm and ooey-gooey. Repeat the dollop of melted candy/top with candy eggs instructions for each macaroon and allow time for the melted candy to cool and set. This tasty Easter Macaroons recipe is sure to be a crowd-pleaser at your next family get-together! These taste just as remarkable as they look! Cut your parchment paper to 12 squares measuring about 3×3 inches in size. Line your each cavity of your muffin pan with your square parchment pieces and set aside. Using two spoons (size tablespoon or larger), scoop your coconut mixture into each lined muffin section, filling it up about 2/3 of the way. Use the back of one of your spoons to create an indent in the center of each unbaked macaroon. Creating this well before baking will help make the “nest” shape to fill later. Remove the macaroons from the oven and allow to cool on a cutting board or cooling rack. In the meantime, place the yellow candy melts and coconut oil in a microwave-safe bowl and microwave in 20-second intervals until completely melted. Stir in between microwave sessions until smooth. Immediately top the melted yellow candy with 3 candy eggs while it’s still warm and ooey-gooey. Once the candy is fully set and cooled, serve, savor, and enjoy ’em! What do you think? 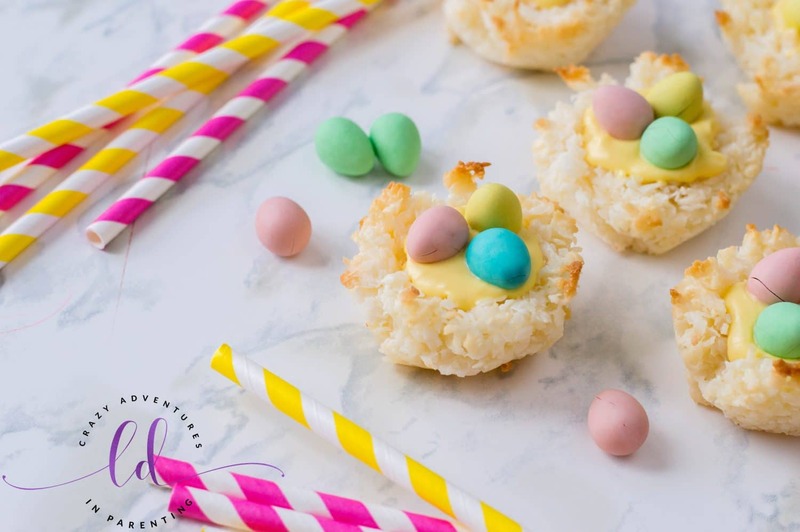 Aren’t these adorable Easter Macaroons perfect with their little candy eggs inside their macaroon nests? If you’re on the “hunt” for more Easter recipes *cough* (get it, hunt? Easter Egg Hunt? Heh. ), be sure to check out our other fun Easter recipes here! We have tons of cookie recipes too along with other delicious dessert recipes, too! Should you decide make these, I’d love it you’d share what you thought with me and our family! I hope you love this recipe as much as we do!